Traffic safety advocates across Washington State are celebrating the news that Governor Jay Inslee has signed a new distracted driving bill into law. Inslee vetoed a portion of the bill that would delay enforcement of the new law until 2019, stating that the changes were so important to citizen safety that they needed to go into effect quickly. What Does The New Texting While Driving Law Change? The new measure bans holding all hand-held devices while you’re behind the wheel. That means no more holding a cell phone, tablet, GPS device, or any other electronic device in your hand while you’re on the road. Not only are you not allowed to hold your phone while your car is in motion, you’re also prohibited from holding it while waiting in stopped traffic or while at a red light. Why Is This New Distracted Driving Law Necessary? Washington state was one of the first in the country to make texting behind the wheel a citable offense—but the law only banned holding your phone to your ear and sending SMS messages, since most phones didn’t have the capacity to send any other type of message at the time. Now, phones have the capacity to send and receive written messages, audio files, live audio, images, alerts, video files, streaming video and push notifications through thousands of app. A state observation team found that cell phone use is the most common type of distraction among Washington state drivers. In a study, they discovered that approximately 1 in 10 drivers had some kind of distraction in their vehicle while they were on the road. Taking your eyes off the road even for a few seconds can result in a serious car accident, and repeatedly glancing between the road and a cell phone can cause attention blindness that can make a driver blind to even an obvious danger in the road ahead. Can You Still Use Your Smart Phone In Your Car? The law acknowledges that many drivers use cell phones to navigate and play music while they’re driving. Those features are still allowed, but you can’t hold your phone in your hand while you use them. Drivers who want to use their phones for this purpose are expected to keep them by their sides or in a dashboard cradle. Drivers are allowed “minimal use” of a finger on their device if it’s a quick tap to activate, deactivate, or initiate a function. If you’re a passenger in a car, not the driver, you’re allowed to use your phone normally. 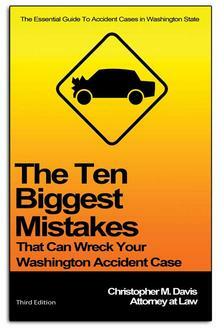 Are There Any Exceptions To Washington's New Texting While Driving Law? Police won’t be likely to make exceptions for people who claim they just had to send a really important text. However, drivers will be allowed to use their electronic devices in a true emergency to contact emergency services. They’re also allowed to touch and use electronic devices to operate a two-way radio, citizens band radio services, or operate an amateur ratio station. What Happens If You Get Caught Texting While Driving in Washington State? The first time a distracted driver is caught breaking the law, they’ll be given a standard traffic fine of $136. That first offense can also be reported to the driver’s insurance company; many insurance companies raise their rates when their customers are caught committing moving violations. On the second offense, the fine increases to $235. Police can also tack on an additional fine of $100 for “any activity not related to the actual operation of a motor vehicle.” That additional $100 fine would be applied to situations in which a driver commits another offense like running a red light because they were distracted by their pet, child, spilled coffee, makeup application, and so forth. When Does Washington's New Law Go Into Effect? Lawmakers are planning on the new regulations going into effect around July 23, 2017. That means citizens have just a few months to change their behavior before it become a fineable offense. What Should You Do If You’re Hurt By A Distracted Driver? Injuries caused by distracted drivers are handled by a separate set of criminal laws in Washington state. A reckless driver who hurts someone because they were distracted by their cell phone can be charged with vehicular assault. As an injured victim, you also have the right to seek compensation from the at-fault driver’s insurance. At Davis Law Group, P.S., our award-winning legal team has spent over 20 years working with victims of distracted drivers. To contact our legal team at any time about an accident involving a distracted driver, you can call (206) 727-4000 or use our online contact form.